Available from New Holland , the Advanced FM-1000 display guidance system features a large 12”/305mm colour touch screen combined with logical functionality. The FM-1000 display guidance system is easy to use and can operate as either a stand-alone manual guidance system or as part of an automated guidance, implement control or steering system. 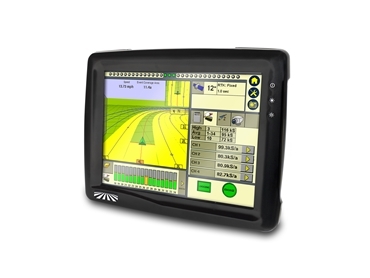 The FM-1000 display guidance system is available at a functionality level and price that fits the needs of farmers, with the option to easily upgrade to higher levels of performance as required. The FM-1000 display guidance system will help gain efficiencies, maximizing the return on investment potential as it is interchangeable between vehicles and can be used across a broad range of equipment platforms. The seven steering patterns range from curves to spirals and an exclusive free-form steering. “This basically means the operator can set the system to work in virtually any field condition, regardless of obstacles or unique field conditions,” Simon explained. The design of the receiver on the FM-1000 display guidance system enables it to pick up a broader range of satellite networks known as the Global Navigation Satellite System, reducing the chance of signal dropout. This ability minimizes the risk of potential signal drop out, allowing operators to keep on working, accurately and reliably, with reduced down-time.